Semiconductor physics and nanotechnologies are the most important fields not only for micro- and optoelectronics, but, first of all, for novel medical applications. Nanotechnologically designed semiconductor materials-based devices (in particular, electric field sensors operating at the room temperature and under external electric fields of various strength) are of special importance for novel cardio-surgery and cardio-therapy. Semiconductor nanoscaled devices are of particular interest for practical investigations in the field of molecular biology (DNA-based molecular sensors). Finding new ways for successful treatments of different various diseases needs novel far- and mid-infrared detectors and light emitting diodes based on new narrow-gap solid solutions ZnCdHgTe – effective and low-cost at the same time. The drugs delivery problem which can also be solved on the basis of semiconductor nanotechnology seems to be extremely important. An enormous number of publications and citations is found under the keywords “semiconductor nanotechnology and nanodevices” showing the interest among fundamental scientists and practically working material scientists and clinicians. The progress in the field “Semiconductor physics and technology” requires new materials and new concepts of the device design. The book edited by Dr. Halyna Khlyap provides a broad overview of theoretical (especially numerical simulations) and practical applications of narrow-gap and chalcogenide semiconductor thin films as well as silicon (both bulk and amorphous film)-based active elements. 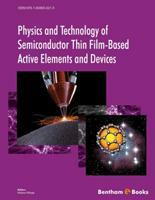 Chapters of the book will make the reader acquainted with a variety of topics ranging from the semiclassical theory of semiconductor heterojunctions to the production of novel unique spintronic devices based on diluted magnetic semiconductors. So, the book should be particularly useful for material scientists and fundamental researchers working in the field of nanoscience and nanotechnology. Semiconductor physics is developing during last decades and now serves as an extremely important field of the material science and novel electronic industry. Regardless of enormous number of publications, the proposed eBook aims to summarize unique results of investigations (both experimental and theoretical) and design of devices based on lead sulfide, cadmium-zincmercury telluride, and chalcogenide semiconductor thin films. Data reported in the book are supposed to be of particular interest for professionals working in the field of semiconductor technologies as well as for high-level undergraduate and postgraduate (also Ph.D.) students.